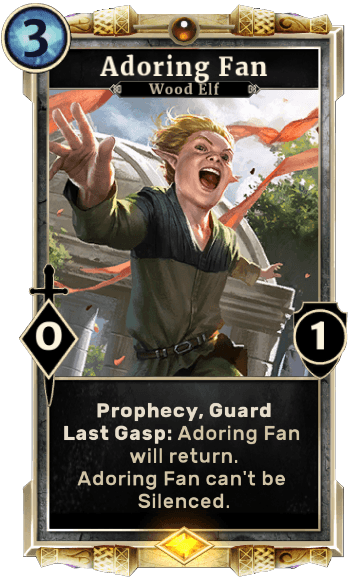 Adoring Fan is a Card in The Elder Scrolls Legends. Last Gasp: Adoring Fan will return. Adoring fan can't be Silenced. BY AZURA ! BY AZURA ! BY AZURA ! IT&apos;S THE GRAND CHAMPION ! This card has lost me 2 games when I played against it. Who even designs such a card? This card is a brainless drop and completely screws up the whole game. When you put even just one buff on this piece of garbage, your opponent can just give up. I&apos;ve run up against this card 2 games already and it completely shut me down because my enemy buffed it with lethal and regen and kept going, I basically couldn&apos;t do anything. Before someone thinks "why not craft and play it too", that&apos;s the same strategy that blizzard takes with hearthstone and is the same mindset the USA has with their gun control: to kill something OP, make more OP stuff. This card is such a no brainer, I don&apos;t get how one comes up with an idea like this. What&apos;s next? A 1 magicka action card reading "Deal 100 damage to a random player. "?Just awesome.